As with every country that faces ten thousands of tourists flocking in every year, Austria has a high density of souvenir shops. They are easily recognised: Usually stuffed with items lacking both usefulness and taste, and normally referring to Austria′s imperial heritage or some composer. My personal favourite is a piece of art that I discovered on the Alter Markt Square in Salzburg once: A transparent piece of plastic called a "crystal", into which the face of Mozart had been "carved" three-dimensionally with a laser. Next to the maestro, a random tourist had been scanned and carved in the same size. Under the two faces - one with a wig, one without - a label announced to the World: "Wolfgang Amadeus Mozart - John". If you are intending to buy things in Austria, do not despair: There are indeed items worth a bit of money. In the following paragraphs, I′ll highlight some typical examples of Austrian craftsmanship which I think would make nice souvenirs that are a bit classier than plastic crystals with your face in it. To me, travelling is directly concerned with eating and drinking local specialities. This applies to Austria as well and there are plenty of high-end delicacies that are typical for Austria. Various schnapps liquors for example, Spätleese and other dessert wines from the Burgenland or sweets. 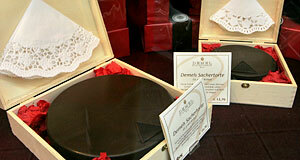 Sacher tarts are sold in Vienna and Salzburg, Mozart balls and the confectionaries of Demel and other famous chocolatiers make a classy souvenir. Good places for buying food is the Graben area in Vienna or any food speciality shop. Lebkuchen (similar to ginger bread) can be stored for months; Styrian pumpkin seed oil, pumpkin seeds or smoked bacon are rustic specialities that you will hardly find abroad. I don′t understand the hype around the glass crystals produced by what is one of Austria′s richest families, but it is a fact that many tourists love them. They are indeed a typically Austrian product and many jewellers and boutiques sell them particularly in touristy areas all over the country. Best bought at the Swarovski Kristallwelten in Tyrol. Other collectables made in Austria include Hummel Figuren, small figurines made of ceramics and hand-painted. "Wiener Bronzen" are bronze figurines made in Vienna since the 19th century - usually animals with human features. They are both expensive and really odd. A nice custom for the time around Christmas and a typically Alpine expression of Christian faith. Austrian nativity scenes or "Krippen" usually come as small models of Alpine farms and with hand-carved, wooden figurines. Christmas Tree ornaments are often made in traditional styles and make nice souvenirs. Many families in Austria also use blooming branches of bushes to decorate what is called an "Osterbuschen" or Easter Tree. They are decorated with painted eggs and other ornaments that you can buy - alongside with Christmas ornaments - in a shop in the Judengasse in Salzburg. All year round. Few places in the World are as obsessed with coffee as Austria. The coffee blends that you can buy are normally of very high quality and despite of coffee not being planted in Austria, it is still sort of typical for the country. At least many beans are roasted in Austria (or Italy), blended (from different varieties) and eventually sold in different types from mild to extra strong. Nice porcelain goes well with coffee - and there is a tradition in making those in Vienna and Gmunden in the Salzkammergut that dates back for centuries. The Augarten Manufaktur creates delicate and beautifully decorated china, whereas Gmunden specialises on rather coarse, rustic designs. A beer stein might be a nice souvenir. Buy it with a specialist and not a tacky souvenir shop, though. Speaking of breakables: Glass production used to be a Bohemian tradition that was partly done in Austria as well. The company "Riedl" makes high-end glasses that sell all over the World particularly to wine aficionados. To finish the tableware, get cutlery and silver of the Berndorf brand. All these items sell in specialist stores. Go to "Shopping: Things to Buy, Part I - Part II - Part III"